Alright, so it’s not the best picture ever, but it’s the best we could do in a crowded parish hall – and I mean crowded! I hope that, at the very least, the smiles on our faces give you some sense of what a truly wonderful and joyful afternoon was had this past Sunday at St. Thomas’ church in Greenville when the Rev. Susan Carpenter was installed as rector. We were just brimming with joy. Now Susan’s installment as rector was personally significant for me, because her calling to be their rector is what has afforded me the chance to be the director at ECC. I’m certainly grateful to Susan for thinking of me for the role, and trusting me with such an awesome responsibility. I was a few minutes late for the installation, thanks to a meeting that ran a bit over, and I snuck into the back of the church as the litany was being sung. Joyce and Lance were right in the back row and were kind enough to let me squeeze in between them for the rest of the service. While I would have enjoyed being with the other clergy, I loved being with Joyce and Lance in the back. I know how much they love Susan and that they will miss her, and they have been SO gracious and wonderful to me as I’ve transitioned into this role. Sitting with them seemed right – like we were a little corner of ECC there for Susan. It ended up being good that I was in the back because I cried like a dang fool through almost the entire service. It was that beautiful. First, it should be noted how incredible it is that St. Thomas’ has grown so much in the last couple of years that they can call Susan as their full time rector. In perhaps the most emotional moment of the whole service Bishop Wolf called attention to this incredible growth. In a short statement after the sermon the Bishop mentioned how many times she had met with the parish to talk about their future, and how she had decided to let them take a chance and see what would happen. At this point the Bishop got choked up and commented that after closing 12 churches it was truly wonderful to be at the installation and celebrating the growth of this parish. It was a pretty special moment. So as if I wasn’t crying enough already (I’m a big crier – I think Lance thought maybe something was wrong with me), right after the bishop’s comment there were a series of presentations made to Susan by other clergy and members of the parish. A stole, bread and wine, the keys to the church. Each person that stepped forward invited her to be part of the ministry of St. Thomas’ and the diocese. Susan is one of the most joyful and loving people I know, and as was said in the sermon, she just gives and gives and gives of herself. I know how happy she was to be installed as the rector there, so it was great to see how happy they are to have her. The sign outside the church reads “The Installation of the Rev. Susan Carpenter, April 29th. How blessed are we? ?” And their feeling of blessing was obvious in their celebration on Sunday. After being given the gifts Susan stood before the Bishop and the altar and read a prayer about her ministry at St. Thomas’ in a loud clear voice, and her passion for her work was abundantly clear. I found myself uttering my own prayers: prayers of gratitude for Susan’s incredible ministries, and prayers of hope for my own ministry at ECC. She’s no easy act to follow, so I can only pray for the grace to share my gifts the ways she has shared hers. The service continued with a heart-warming “The Peace of the Lord be always with you!” from an emotional Susan, followed by Eucharist with joyful singing, and a final blessing and dismissal from the new rector. A BIG ole party followed, and support for Susan and St. Thomas’ was overflowing. Having had the pleasure of being supply at St. Thomas’ I can speak to what a wonderful group of people they are. They are blessed to have Susan, and she is blessed to have them. Thanks be to God! 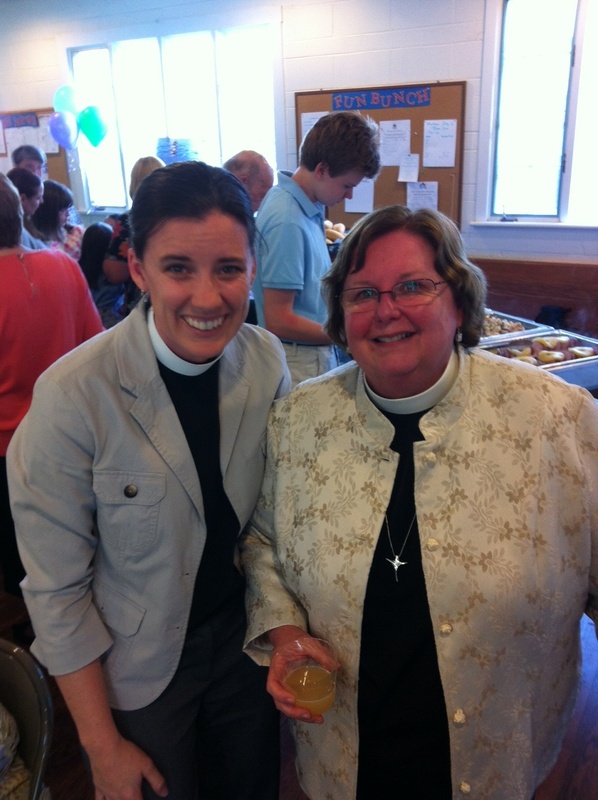 Meaghan – thank you for doing such a lovely job of capturing this important day in the celebration of my new ministry at St. Thomas! It was such a joyful day, and I was so thrilled to see you sitting with Lance and Joyce when I turned to face the congregation at the peace. Sort of coming full circle for me…. You would think it would get easier to trust God as you get older, but I still struggle sometimes. When the Bishop asked me to consider taking on both ECC and St. Thomas’ I floated home in a cloud of happiness – the only concern was the BIG question – how am I EVER going to decide which one I get to keep for the long haul? And of course, the answer is that I didn’t have to decide at all. Taking myself out of the equation and paying attention to what God wanted for both ministries was the key – and once I leaned into that in my discernment, everything else fell into place. It became clear to me through prayer that St. Thomas’ was where I was called to serve. And they came to the same conclusion. Then the BIG concern was who would be the right person for ECC? I love ECC, as so many of us do, with great passion. It was as instrumental to my spiritual journey as it has been to so many people over the years – blessings upon blessings have been mine in my interactions in my many roles at our beloved camp – as a camper myself, my sons were campers, counselors and staff, as a lay person on visiting staff, a leader of conferences and now as clergy and the director. So my being able to answer the call to be rector at St. Thomas’ absolutely hinged on finding the right person for ECC – I had sleepless nights as I prayed for my beloved counselors and staff, wanting them to have someone minister to them with love and energy and joyfulness. And the only answer that kept coming to me was it had to be you, Meaghan. And so – God is good, ALL the time. This whole process has God’s fingerprints all over it. Is it hard to leave ECC – you bet it is! I can be greedy – wanting more and more of the really good stuff – and ECC is good stuff! When camp starts, I know my heart will hurt a little bit because I won’t be there. But that’s OK – I know to the bottom of my heart I am right where I need to be. I absolutely love my St. Thomas’ folks! And my leaving has created space for you to be there – and that is the right path for ECC. You, Meaghan, and the entire community will always, always be in my prayers. I don’t need to tell you that awesome work goes on there – people develop a relationship with God, a relationship with each other, discovering in the process who they are. I am filled with gratitude that you are the lucky person who gets to be the next director – and that you will do fabulous things with the good people up there! I know this to be true. You have all the many gifts you need to be an effective and loving director and you will carry this special place into the future impacting the lives of our precious young people. And the incredible staff deserves the best possible person to lead them. You are a blessing, my dear, and I am so grateful you answered this call to serve. You are going to have a ball! Thanks be to God, indeed!! I love you two! I’m a big crier as well. And have cried often in Susan’s presence. I’m so happy when she comes, so happy to spend time with her, so happy for her ministry, so sad to see her go, so happy when she comes so happy for her ministry, so sad to see her go….. I am so thankful to you BOTH for your obedience to your calling! Susan you have planted a seed in my children that grew into a tiny sprout last year and now Meaghan gets to water and with God’s Light we all get to watch it grow! I pray they will grow into the beautiful servants you two have become. And I pray for myself to have the strength to continue to follow your example.